anyway, according to a couple people mini thor will attack a zergling but i have yet to see it with my own eyes. i'll try to find someone in dalaran with a zergling pet to test it out. looks like grunty is going to have some competition! melodieous of warcraftpets.com found a possible critter and/or companion model via WMV: it's a raccoon! the cuteness leaves me speechless. 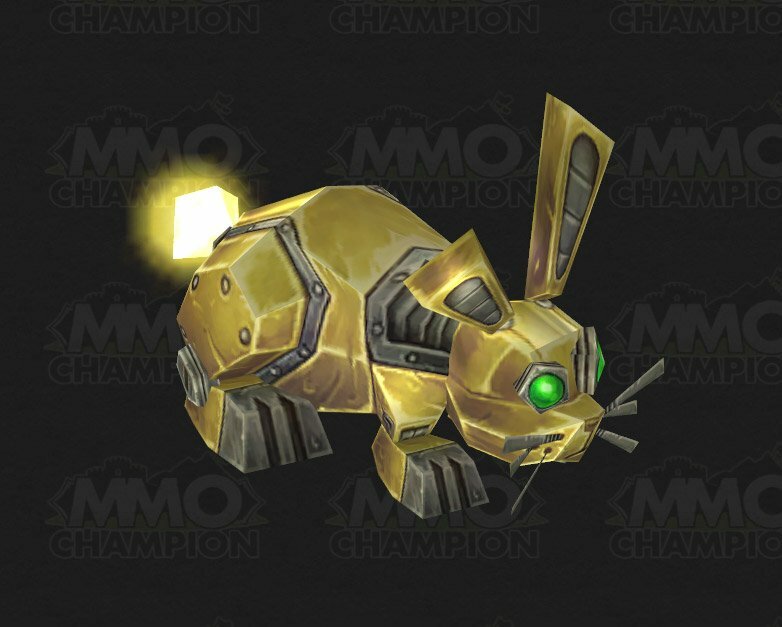 judging from the first one's icon, it looks as if it may be the mechanical bunny, who's image was data mined thanks to mmo-champ. 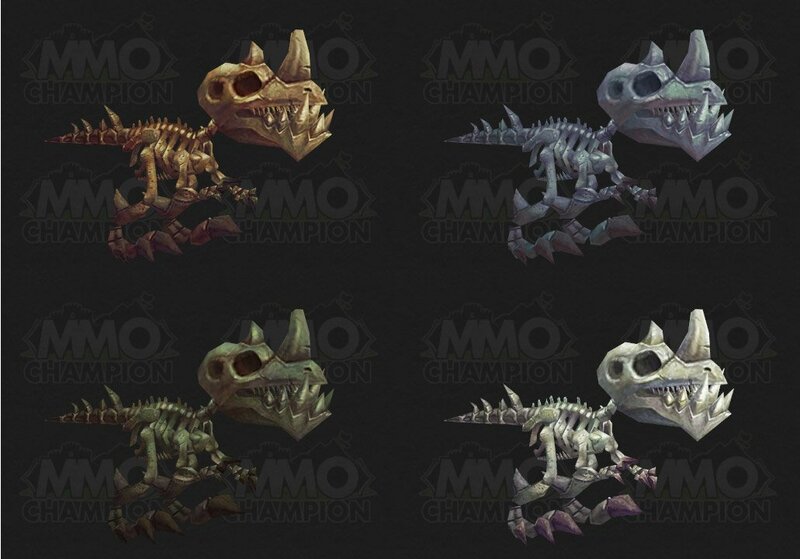 the second one is likely to be the skeletal raptor babies, image also data mined by mmo-champ. as for the last one... i have no clue! personal world destroyer could be a ton of things in wow. :P even though it doesn't sound like a pet, it was listed under companion spells and has the usual "Right Click to summon and dismiss your Personal World Destroyer" text. items and spells have been listed incorrectly before, and this item could change before the expansion goes live, so we'll just have to wait and see. i don't know about everyone else but hunting for vanity pets, even if they don't exist yet, is so exciting for me! the internet stream version of blizzcon 2010 is now available for purchase. $39.95, no DIRECTV subscription necessary. much like the starcraft2 situation, i'm reluctant. there just isn't as much information as i would like to be able to go ahead and make the purchase with confidence. i'd rather not put my money on the line without knowing what the redeemable "in-game item" is. will it be a pet? a mount? other? whether or not i spend $40 on blizzcon 2010 depends on the answer. i hope that blizzard makes the announcement soon; i'd rather not miss out on a chance for a companion. i'm slightly paranoid that the direct stream sale will close before i get a chance to throw my money at it. side note: i'm not enjoying this lack of information on blizzard products lately. are they deliberately doing it? i don't know. but it's grating on my nerves since many of my decisions are dependent on specific details that blizzard is either unwilling or unable to provide upfront. "I got the Mini Thor today. You get it in your mailbox for each char after adding the Starcraft 2 CE to your Battle Net Account. No additonal code necessary. Therefore it is impossible to sell the pet separately, without the CE game code. If you have more than one WoW-Account, you get the pet on each one. It is bound to your account and does not disappear from your bag after learning it." unless someone else can prove otherwise, it seems as if blizzard has decided to make mini thor bound to whoever uses the CE SC2 game, rather than making it a separate code. it's both good and bad news, i suppose. good news for those who love starcraft AND world of warcraft and have already purchased the collector's edition. bad news for those interested in starcraft but not world of warcraft. also bad news for those who don't want to shell out $100 for a game that they have little interest in just for a world of warcraft companion. guess we won't be seeing just the pet going up on ebay this time around. exclusive pet is exclusive. it kind of confuses me as to why blizzard took this route. not all starcraft lovers enjoy world of warcraft, so mini thor isn't really a big plus in terms of collector's edition extras. you'd think they would have made mini thor a redeemable code so that those who don't care for it could sell it, making the collector's edition that much more worthwhile. then again, i guess most buy collector's edition games not only for the side gifts but more for the prestige in general. did i give in and finally order a collector's edition SC2? no. and in light of the initial news of it being account bound to whomever uses the starcraft game, i don't think i will be (my friend put a down payment on SC2 but the store said if there were any extra copies of the CE version on release day, he could upgrade). i would have only invested in a CE copy if the pet were redeemable on my battle.net account while the game went to his account. my friend would be playing the actual starcraft game more than i.
anyway, i'm still waiting for more information on this vanity pet since it's still very early and the game technically hasn't been officially released yet. still no word on any interactive animations, but i'm hunting! this lucky person received the collectors edition of starcraft 2 early (release date is July 27th), and captured mini thor in action! how cool is that? note how mini thor has a sub-tag of "the destroyer" (much like mini diablo has an extra title, "lord of terror"). also, there is a feat of strength achievement in wow tied with this new companion: collector's edition: mini thor. no explanation as to why. is it sold out? was it a limited edition item (because they want to keep it "rare" *rolls eyes*)? are they fixing a bug either in-game or in the PetStore? we're left hanging with no clue as to when lil' xt will be available again and why it suddenly had to be removed. while this is disappointing, especially for new collectors and players, this is not all that surprising with all of their non-combat pet bloopers lately. am i pointing fingers? sort of. color me a disgruntled pet collector. blizzard's treatment of the collecting community lately has been dismal and their seemingly lack of empathy/sympathy for those who take collecting seriously is disheartening. there have been so many bumps, bugs, and boo-boos when it comes to companion pets lately that it's hard to overlook them all and just chalk it up to blizzard being busy. i guess maintaining in-game collecting just isn't high on their priority list. part of me understands and acknowledges that a big company has to do what they have to do, yet another part of me refuses to accept that overlooking ANY type of gameplay and satisfaction of customers is the way to handle business properly. then again... my standards for work ethics is quite high, maybe too high to hold blizzard to. one can only hope that they will somehow make it up to collectors in one way or another. call me pessimistic and a downer, but i'm not going to hold my breath. i've been in a bit of a pet drought lately. not much to farm or work for, and the next holiday that could possibly bring a new vanity pet is still quite a ways away. this does give me some time to work on other projects, though. i haven't had much free time to spend on the beta servers, so there isn't much to report or write on at the moment. i need to make a note to myself to check the beta for all the "old world" companions such as the whelplings and other world drops. with the terrain changes i did notice that some of the mobs that currently drop pets had to be moved or were missing entirely, but that was when the NDA was first lifted and things could have changed since the last patch. hopefully i'll get around to making a list of the world drop companions that i need to check for on the test servers. man, it's either going to be a real pain re-farming all those world drops on the beta or a huge nostalgia run. i'm guessing it will be a bit of both? heh. well i haven't been able to find much companion pet love on the beta other than the withers pet. i attempted to go to the worgen starting zone to see if the worgen race-specific vanity pets were available, but i ended up getting stuck in the incorrect zone/phase. doh. this leads me to believe that beta just isn't far enough yet, so we'll just have to be patient for more updates to the test servers. but! in a somewhat vanity pet related note, i did manage to find a horde only companion... sorta. it's called the lashtail hatchling and looks nearly identical to the razzashi hatchling. 1. The entity is summoned via a summoning spell found in the character's Pets tab. 2. The entity counts toward various Vanity Pet Achievements. 3. The entity must have the tag of companion. so technically it cannot be considered a true "vanity pet." see why below. after finally receiving the frigid frostling, i think it's only right to sum up my thoughts and feelings about this new holiday loot bag system. i lost count of the days after about the first 5, and i had to keep going back to my older entries to figure out what attempt number i was on. they say hope for the best, prepare for the worst right? i didn't even bother hoping after a while. i lost hope after about my 6th or 7th attempt. queuing for ahune became more of a routine rather than an act of enjoyment or anticipation. to be honest, i'm quite surprised that i even managed to get the companion. those raptor pets look awesome! i hope they also come with neat corresponding animations (example: the leaping hatchling will periodically leap towards its owner.) what on earth does a skeletal raptor sound like? grinding... stone? lol, well i can't wait to preview them on the beta servers. the chain is pretty linear so don't be too worried about which quests to do and which to skip. if you're being sent to the ruins of mathystra, you're on the right track. don't forget to loot bodies! anyway, be sure to check out the "new" zone once cataclysm is released even if withers is no longer available. it's really very impressive! *i must stress that what is on the beta servers may not be what goes live when the expansion is released. so don't get your hopes too high just yet.